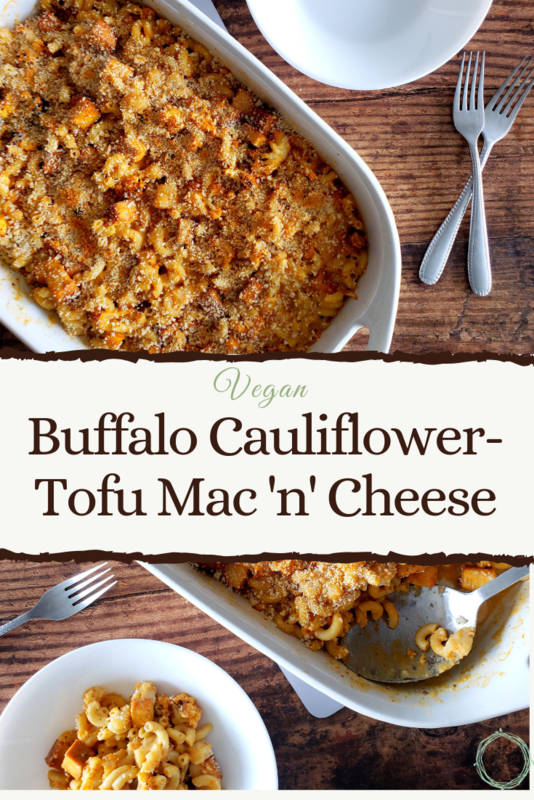 Make this savory buffalo cauliflower-tofu mac 'n' cheese for a healthy dinner today. 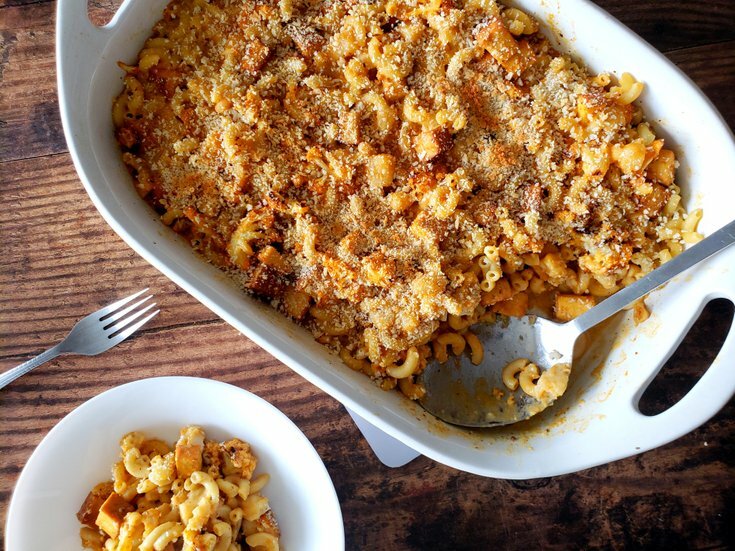 It's savory, super creamy & the definition of comfort food. Cauliflower wings are good and all, but have you ever had a full on buffalo cauliflower casserole? Life-changing! 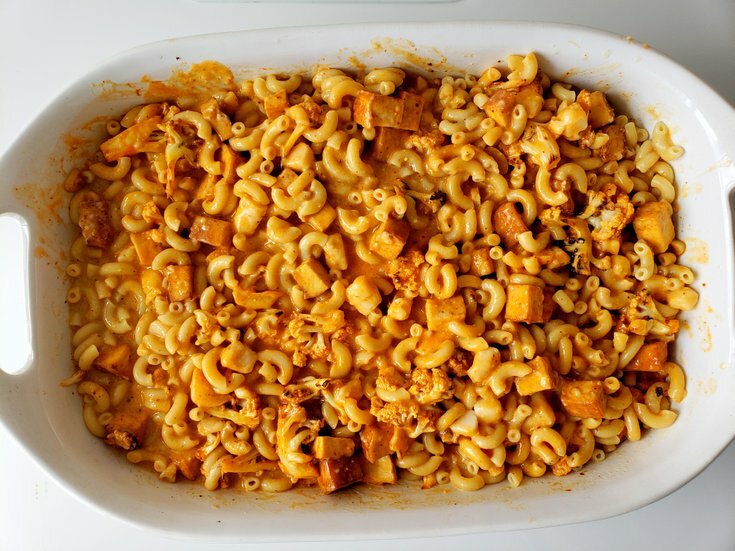 Plus, the buffalo cauliflower wings are harder and messier compared to this buffalo cauliflower-tofu mac 'n' cheese. The wings are still delicious, don't get me wrong, but this recipe is definitely a worthy contender. 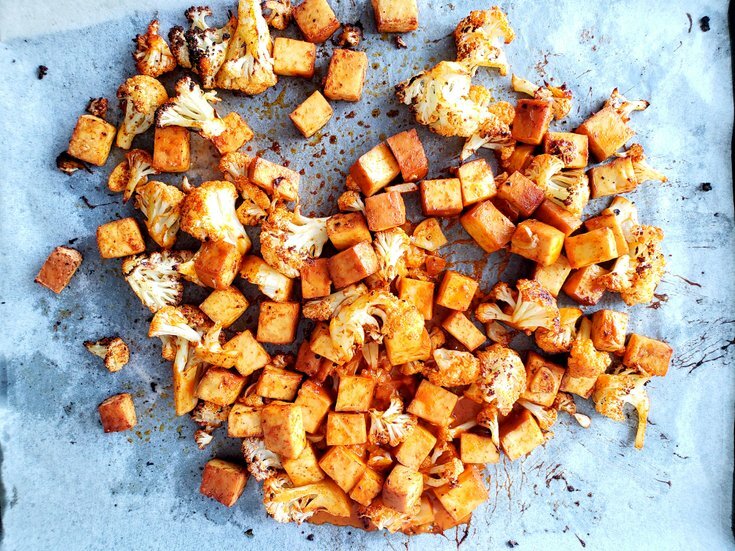 First, preheat the oven 400° F.
Then, toss the cauliflower florets and cubed tofu (1 1/2-inch by 1 1/2-inch) in olive oil, garlic, salt, pepper, and smoked paprika. Next, cook on a baking sheet for 10 minutes. Then, take out the cauliflower and tofu, drizzle the 1/4 cup of buffalo sauce and cook for an additional 10 minutes. Now, cook the pasta according to the package, but leave slightly al dente. Next, is the roux! Start by melting vegan butter over medium-low heat, then add the flour. Stir vigorously for 2-3 minutes until you have a light roux, that's slightly puffy. Once you have your roux, pour in the cashew cream slowly, stirring constantly. Don't worry too much about messing it up because the nutritional yeast will help thicken the sauce. The noodles will also soak up some of that moisture as well. Stir in the nutritional yeast and Dijon mustard, and cook for 1-2 minutes. Then add the cubed smoked gouda cheese, and cook over low heat until the cheese is slightly melted and the sauce thickened. I like to melt the cheese only slightly so that you get little cheese bombs throughout the casserole. 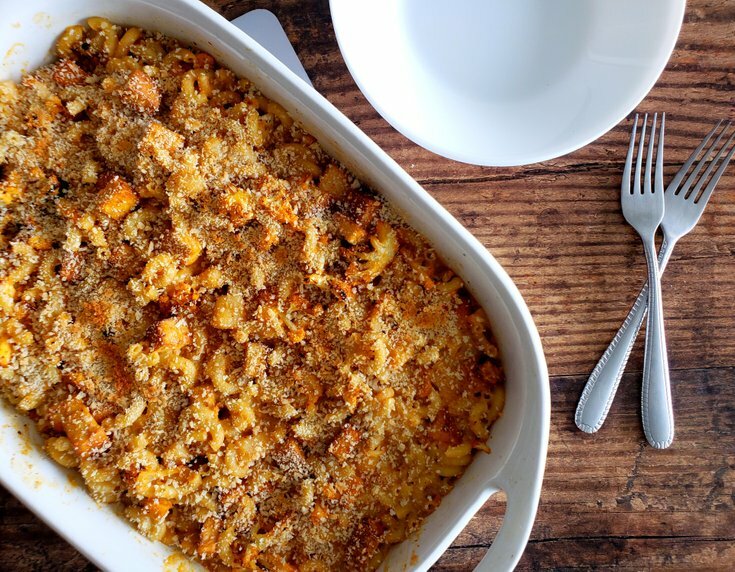 Add the al dente macaroni noodles to a large casserole dish, then mix in the cheese sauce and the 1/2 cup of buffalo sauce. Next, top with the panko crumbs, then put the casserole into the oven on high broil for 5-10 minutes or until top lightly toasted. 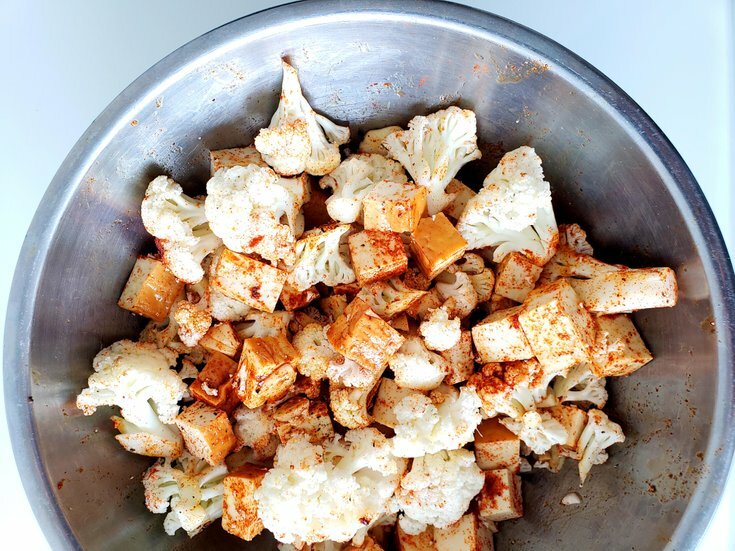 Toss the cauliflower florets and cubed tofu (1 1/2-inch by 1 1/2-inch) in the olive oil, garlic, salt, pepper, and smoked paprika. Add to a large baking sheet, and cook for 10 minutes. Then, drizzle with the 1/4 cup of buffalo sauce and cook for additional 10 minutes. Cook the pasta according to the package, but leave slightly al dente. Melt vegan butter over medium-low heat. Then, add flour. Stir for 2-3 minutes until you have light roux, that's slightly puffy. Pour in the cashew cream slowly, stirring constantly. Next, stir in the nutritional yeast and Dijon mustard. Cook for 1-2 minutes, then add the cubed smoked gouda cheese. Cook over low heat until cheese is slightly melted and sauce is thickened. Add the al dente noodles to a large casserole dish, then mix in the cheese sauce and 1/2 cup buffalo sauce. Top with the panko crumbs. Next, put casserole in oven on high broil for 5-10 minutes or until top lightly toasted.